Just to further that last point, I wouldn't worry too much about the amount of moisture above say 700 hPa as it has no direct effect on the amount of CAPE. That is not to say that it is not important. Too much moisture in the mid/upper troposphere is often associated with clouds which of course block out the sun and keep surface temperatures lower. This results in less CAPE and potential problems in breaking the cap. Furthermore, when the mid/upper troposphere is extremely moist the mid-level lapse rate is often quite poor. Assuming though that there is no problems with cloud cover and that mid-level lapse rates are steep, the amount of moisture above 700 hPa will affect storm characteristics, however, these are reasonably minor. For example, with dry air in the mid troposphere, dry air may be entrained in the storm's downdraft resulting in greater evaporative cooling. This makes the downdraft more negatively bouyent resulting in a stronger downdraft. This may actually in some instances have a negative impact due to the downdraft undercutting the storm's inflow region (I believe). interesting comment Michael, would this be a source of microbursts, like those that have downed aircraft ? Finally after all these years a thread for something that has perplexed many of us !!! Thanks Michael et al - I'm reading feverishly and no doubt havea question or two later. With regards to the CAP and CIN: If the CIN number is below 20 then that is what I understand to be good as far as no great inhibition for storms to break through? What about the CAP values? Sometimes I see the sounding and it has a minus value next to it, so which is more preferable - a minus or without and what do they tell me? Can the sounding tell you at what height convection will be maximized? ie: storm tower height - the colder the better? So many questions I will try my best. First of with capping and CIN. As far as I am aware, the cap is more of a slang term for convection inhibition (CIN). Think of it as a cap of a bottle keeping its contents in place, the cap keeps the warm moist air from rising. Since the individual letters do not stand for anything, upper case is not needed (cap vs CAP). A minor point and a little too picky maybe. I cannot not tell you what values to look at for CIN unfortunately but I can say it does vary. Sometimes a strong cap may be in place but storms will still form with strong forcing. In such situation, I strong cap can actually keep storms isolated rather than forming a squall line. This is hugely important in US where if storms remain as descrete supercells the risk of tornadoes is much higher than if too many storms form and merge to form a squall line. On the otherhand, the cap will need to be weaker if little forcing is present to intiate convection. If capping is too weak however, storms will most likely form early before peak heating. Also, numerous storms may form and interfer with each (rather than a large supercell with only warm moist air in its path). Regarding storm height, this is easily read form a sounding. The level at which the Theoretical Air Parcel Plot line (TAPP) crosses the temperature trace is known as the Equilibrium level (EL). This is the level where storms anvil out. Note though, a strong thunderstorm can overshoot this level resulting is storm tops above the EL. For this reason, on any given day, the taller storms are most likely to be the strongest but storm height is largely dependent on the height of the EL. As you can see in the soundings below from Darwin the EL is very high compared to those of Brisbane.This would result in higher thunderstorm but not necessarily stronger storms (so many other factors are important, such as wind shear, mid-level lapse rates, surface boundaries etc). Interesting to know, the temperature of the tropopause is actually colder in the tropic than the poles and mid latitudes. This can be seen with the soundings below. Take the darwin soundings, the temperature is around -85 at 100 hPa whereas in Brisbane on the 8th of October the temperature of the tropopause is around -66. CAPE and CIN are both obtained from a measurement (by integrating) of the area between the TAPP and the temperature trace (ELR) on Michael's skew-t's 1 and 3 above. Where the TAPP is to the right of the ELR - this is positive buoyancy = CAPE -- since the parcel (depicted by the TAPP) is warmer and therefore less dense than its surrounds and will want to rise. Where the TAPP is the the left of the ELR that is negative buoyancy = CIN (that is the parcel is cooler and therefore denser than it surrounds so it will sink). Both are usually expressed as J/kg (Cin being -ve). Looking at the 2nd skew-t above, we can get an idea as to the height of the storm anvil's upper levels by looking at the equilibirum level, which is where TAPP and ELR again meet. In this case somewhere above the 200mb line ~13km. Of course the actual storm tops can be momentarily or, in the case of an intense, sustained updraft (mesocyclone) can be persistently higher than this equilibrium level. This is because when there is sufficient upward momentum then the parcels overshoot the equilibirum level by several km or more even though they are more dense at that point. Evenutally, they run out of puff and as storm chasers we often see this as an anvil dome or overshooting top. CIN (SIN) is used to determine the strength of a CAP. Michael T: I think CAP gets used instead of just cap so it stands out in the descriptive text. I don't look at values for CIN - probably because that and CAPE are not even displayed on the BoM soundings for some strange reason. I guess you get to know whether the CAP will break from past experience and the setup. And calculating the possible height of any forecasted storms/CUs can be had by adding one's current DP and Temp from the sounding during replotting it and multiply them by 220 ? After talking to the Met officer at BoM he said that for here re the soundings I should be replotting the skew-t using the 50mb range as our DPs change so much that our storms get much of their energy from just about ground level! For CAPE he indicated, that whilst there's lots of CAPE through the entire trace, if I want to look for decent strong to severe storms then cape in the lower portion of the trace is the key. CAPE on 15th Jan on the sounding is nudging 4000 but when the storms hit town it was 5000 - hence we had two big storms and downpours in the city. This indicates really good updraft strength in the lowers for storms rather than the 'overall' CAPE in the atmosphere. You can see by our sounding when replotted with the averaged obs at the time of replotting that CAPE at the 600 was very high, this is what caused the large storms to come through in the late afternoon. Over 60+mm fell over an hour or so. I asked him about the big slot of dry air in the mids and I always thought that this would create too much drying, but to the contrary. MB and he confirmed that this dry air is actually beneficial to disperse the moisture and watching the storms in the afternoon it was clear to see it do just that and strong winds aloft also were aiding the spread of anvil wash which when formed, they really did fan out quickly and thin. As far as triggers are concerned...we talked about that also. We put some scenarios back and forth and he agreed that good triggers for storms are troughs, boundaries and the like. They may not be visible on maps or charts as they are not real time, but sea breezes pushing inland can cause a boundary (as in the Humpty Doo tornado) and seeing convection form in a line is a visible trigger. He said the trigger is the $64,000 question. It's something that chasers take more note of when searching for storms rather than forecasters and it's only when they see condition/satpics/radar change for pending severe weather that they can formulate the prognosis prior and during the storms lifespan. Of course they have the benefit of real time imagery at their disposal - so it's a bit of an oxymoron! This particular thread topic has helped indeed in understanding the soundings better and now at least I can decipher them for possible storms and afterward to see how the atmosphere changed when storms fired up. It really depends on how quickly overall weather patterns are moving or changing since the sounding. For example - you need to forecast whether upper level temps may have cooled, warm, or stayed about the same. Then consider whether the surface conditions have changed by using real-time obs. There is no set rule - you consider the sounding then factor in all things that could change using model output and observations. to fire up somewhat nth of the city. and that they did. presented ...digest it ... and then get into more refined questions. Thanks to everyone regarding aerological diagrams. I have printed it out and study it as much as possible. I was wondering though, how to forecast snow on these charts. Each year, my wife and 2 daughters do a trip to Stanthorpe and then where ever we dare to venture. 2006 we ended up travelling right down to Tamworth, missed the snow by a week, (small town just north, had a good snow fall the week prior,). the day we arrived, it was approx high teens, even the receptionist from New Zealand could not believe how it had warmed up. 2007 was very cold but we missed the snow in Tenterfield by approx 4 days. So what are the important factors to look for, if any one can help, I will truly appreciate it. I tried looking at the archive soundings but not sure which station and time to try and see what data shows the event. There are sounding examples included for some recent events. If you have some specific questions still not answered please then ask them here. Thanks very much, I have hours of reading there, it will be of a great asset for us in our limited yearly snow trek. If this year pans out to be cold as predicted (by some forecasters) we might extend the girls holiday. I think this is the Aero-diagram for the 9th of July snow fall from the Moree station. I was forgetting about adding the 9 hours ( i think) for the UTC time. Is it correct in using the previous day's DP's and the following day's DP's to calculate whether this will enhance the CAPE? I know that often non-real time CAPE numbers are actually factored in, in the morning sounding here from the previous day/night due to high levels of DP which are higher than the actual temps. So if one was pondering the question of okay, the DP's overnight were fairly high compared to the temp, should i factor this in when dissecting the sounding for the previous day in determining CAPE valoues for storm initiation and would potential storms be using this for formation? On the sounding is this true when looking...CAPE values from the SFC to 500hpa are more likely to initiate mid-level storms and CAPE below 500, if good, are surface based? 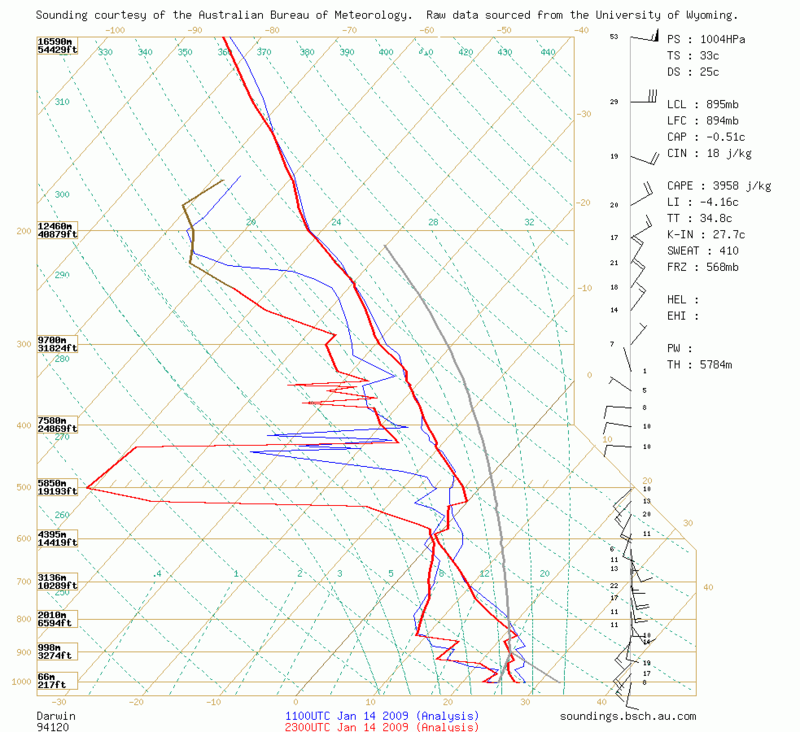 If so on the sounding how can one see that updrafts reach 20C or colder to initiate electrification (lightning)? Is it a good sloping lapse rate to this level where one should be looking? So looking at the skew-T at what point does one pen to locate this? Hey everyone. Thanks so much for that,about trying to decipher soundings. Yes,I've been scratching my head also about what everything means. Some i have worked out myself and from finding info to help me,i will admit i am a novice. There is a couple of questions i would like to ask,the 8 green dashed lines going from the bottom (ground level) up and to the right to the 700 hPa height,is that dewpoint ?,and on the upper right-hand side where the values are,i'm gathering that the CAP value is in Celsius yes ? Again,thanks for explaining how to read the charts,starting to sink in now !